Peace was not something that came easily in Tudor England. The War of the Roses was finally at an end but few people were under the illusion that the struggles were over. There was always a new threat on the horizon. Always a new enemy to be confronted, or an old to be re-confronted. The newly built Tredegar House encapsulated this. Built by Sir John Morgan, probably c1490, it was built around three sides of a central courtyard, its windows faced inwards for defensive purposes. These were indeed still dangerous times. Morgan ap John had succeeded his illustrious father in 1492. Tales and songs of 'The Fat Knight' were probably still well known in the locality. In many ways, Morgan had a big act to follow. He was, however, a firm Tudor supporter, and served his king on the battlefield. If his father had helped put Henry VII on the throne, Morgan would help in keeping him there. Although, if truth be told, the battle that Morgan participated in was rather more one-sided than the fabled Battle of Bosworth Field. Henry VII had a problem. In 1491 a figure appeared in Ireland claiming to be the younger of the two Princes in the Tower. It did not really matter that he was an imposter by the name of Perkin Warbeck, a Flemish custom officer's son. Warbeck was a dangerous symbol around which enemies of the Tudor dynasty could rally. He had been proclaimed as 'King Richard IV', moved to Scotland, where he married a Scottish noblewoman and found an enthusiastic ally in the Scottish King James IV; he threatened to invade England and clearly was a danger to the new regime. Henry VII raised taxes to fund an invasion of Scotland. This, in turn, caused unrest in Cornwall. The hard-pressed Cornish tin miners already lived in poverty, were already taxed on the small amounts of money they were making, and felt aggrieved that they had to suffer further for a struggle so far away that they did not feel involved with. Two local men, Thomas Flamank, a lawyer from Bodmin, and Michael Joseph, or Michael 'An Gof' ('the smith') raised an army to march on London against the King and his taxes. On the roads to London they gathered more supporters. Yeomen from Plymouth joined the march, and they were joined by Lord Audley from Somerset who took command of the rebels. Some have estimated the group numbered 40,000 by the time it reached London. Unfortunately, although sympathetic to the cause, many of the marchers did not want to encounter a well-drilled, well-equipped army of the King on the battlefield, and they drifted away leaving about 15,000 rebels, armed with mainly country weapons, to face the King's forces. Among the King's forces that met the Cornish rebels at Blackheath on 17 June 1497 was Morgan ap John of Tredegar. He must have been very confident of success. The odds were stacked massively in the King's favour. They numbered 25,000 to the rebels 15,000, and, far more importantly, they had horse and artillery. The battle was a complete mis-match. Estimates of losses vary; some say 300 rebels were killed, others maintain that figure should be closer to 2000. All agree, however, that the King's forces were barely scratched, their losses were claimed by some to have been in single figures! After the battle Morgan was knighted. He died in 1504 to be succeeded by his son, John. The leaders of the revolt were executed. Michael An Gof went to his death defiantly, claiming that his name would be "perpetual" and that he would gain a fame "permanent and immortal". Thomas Flamank died urging "Speak the truth and only then can you be freed of your chains." 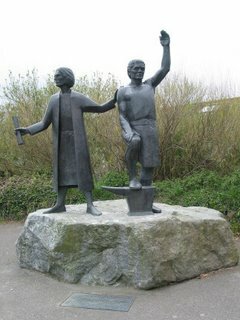 500 years later, in 1997, the Battle of Blackheath and the Cornish revolt was remembered when thousands of Cornish people took part in a memorial march from Cornwall to Blackheath. A statue of An Gof and Flamank now stands in the village where it all began in 1497.